Earlier today, I referred to a recent study about inequality and life expectancy in the United States. 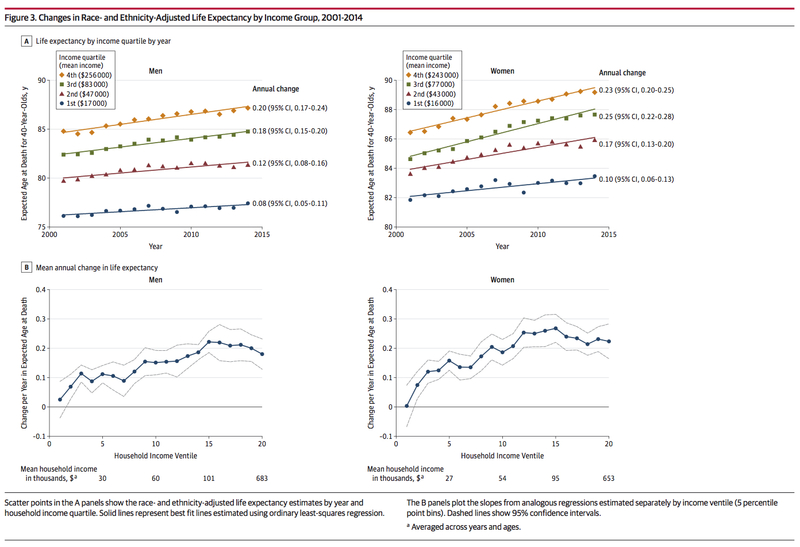 The chart above is from that study, “The Association Between Income and Life Expectancy in the United States, 2001-2014,” published by (and now available for free in) the Journal of the American Medical Association. The first major conclusion is that life expectancy increased continuously with income. There was no dividing line above or below which higher income was not associated with higher life expectancy. 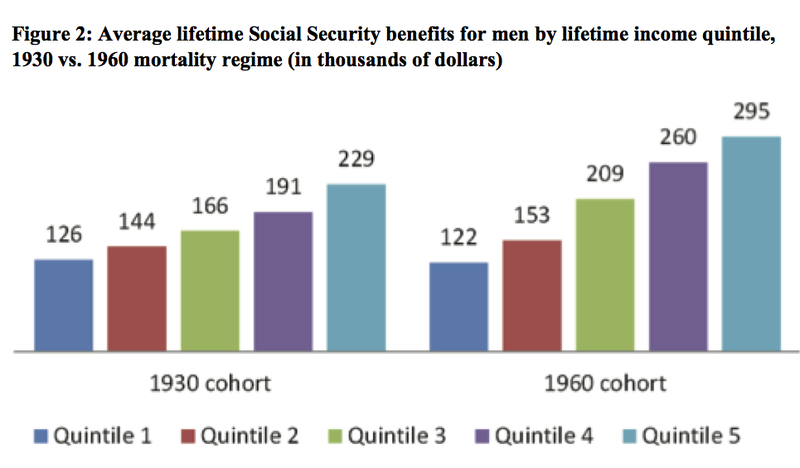 Between the top 1% and bottom 1% of the income distribution, life expectancy differed by 15 years for men and 10 years for women. These differences are placed in perspective by comparing life expectancies at selected percentiles of the income distribution (among those with positive income) in the United States with mean life expectancies in other countries. For example, men in the bottom 1% of the income distribution at the age of 40 years in the United States have life expectancies similar to the mean life expectancy for 40-year-old men in Sudan and Pakistan, assuming that life expectancies in those countries are accurate. 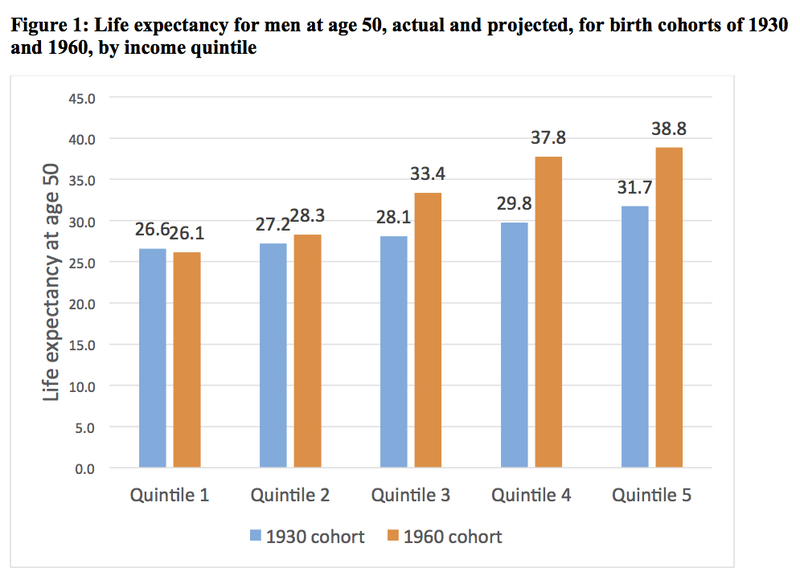 Men in the United States in the top 1% of the income distribution have higher life expectancies than the mean life expectancy for men in all countries at age 40 years. . . 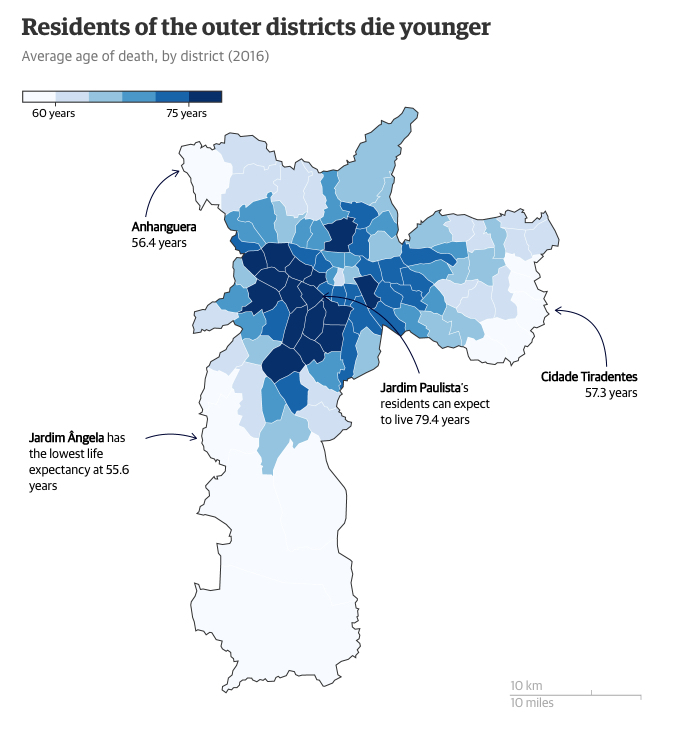 The second major conclusion is that inequality in life expectancy increased in recent years. Between 2001 and 2014, individuals in the top 5% of the income distribution gained around 3 years of life expectancy, whereas individuals in the bottom 5% experienced no gains. As a benchmark for this magnitude, the NCHS estimates that eliminating all cancer deaths would increase life expectancy at birth by 3.2 years. You read that right: U.S. men in the bottom 1 percent of the income distribution have life expectancies similar to the mean life expectancy for men in Sudan and Pakistan! And the gap between those at the top and bottom is growing! What we have then is technical chart with a very important political message: now more than ever, we need a radically different way of organizing economic and social life in the United States—unless, of course, we want to remain at the level of Sudan and Pakistan. That racket—and, with it, challenges to the legitimacy of capitalism—was evident in a wide variety of news stories yesterday. First, there was the issue of health. Once again, we’re learning that the capitalist racket is affecting health. 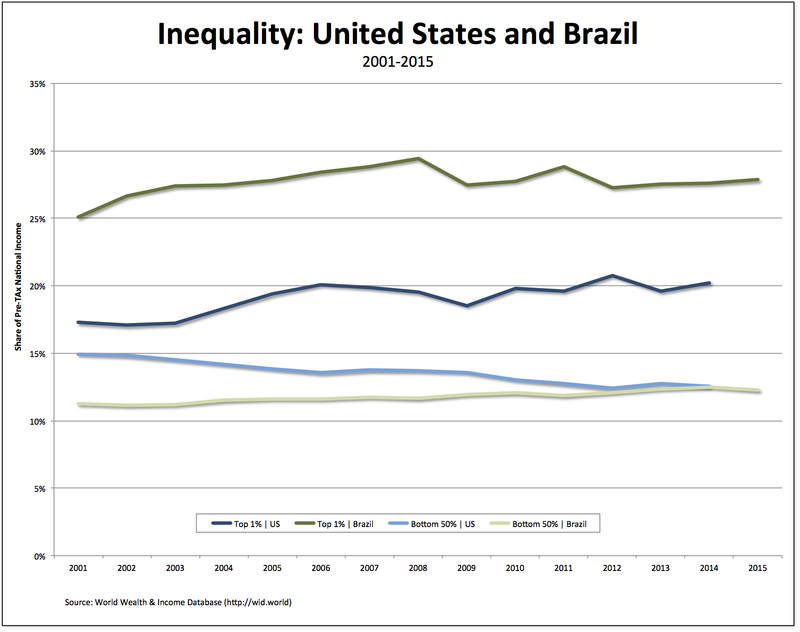 In particular, the gap in life span between rich and poor is widening. 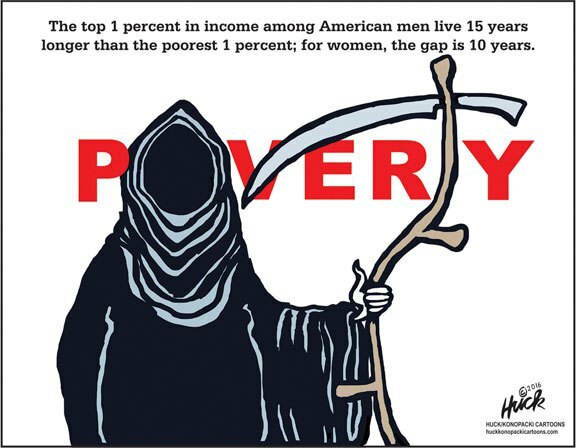 The top 1 percent among American men live 15 years longer than the poorest 1 percent; for women, the gap is 10 years. These rich men and women have gained three years of longevity just in this century. Public health experts say the rising white death rate reflects a broader health crisis, one that has made the United States the least healthy affluent nation in the world over the past 20 years. The reason these early deaths are so conspicuous among white women, these experts say, is because in the past the members of this comparatively privileged group have been unlikely to die prematurely. . .
[Anne] Case said that the whites who are dying are not America’s elites. Second, consider the problem of international trade. Michael Riordan challenged Carrier Corporation’s recent decision to transfer its Indianapolis plant’s manufacturing operations and about 1,400 jobs to Monterrey, Mexico. The transfers of domestic manufacturing jobs to Mexico and Asia have benefited Americans by bringing cheaper consumer goods to our shores and stores. But when the victims of these moves can find only lower-wage jobs at Target or Walmart, and residents of these blighted cities have much less money to spend, is that a fair distribution of the savings and costs? Recognizing this complex phenomenon, I can begin to understand the great upwelling of working-class support for Bernie Sanders and Donald J. Trump — especially for the latter in regions of postindustrial America left behind by these jarring economic dislocations. And as a United Technologies shareholder, I have to admit to a gnawing sense of guilt in unwittingly helping to foster this job exodus. In pursuing returns, are shareholders putting pressure on executives to slash costs by exporting good-paying jobs to developing nations? The core of the revolt against global integration, though, is not ignorance. It is a sense — unfortunately not wholly unwarranted — that it is a project being carried out by elites for elites, with little consideration for the interests of ordinary people. 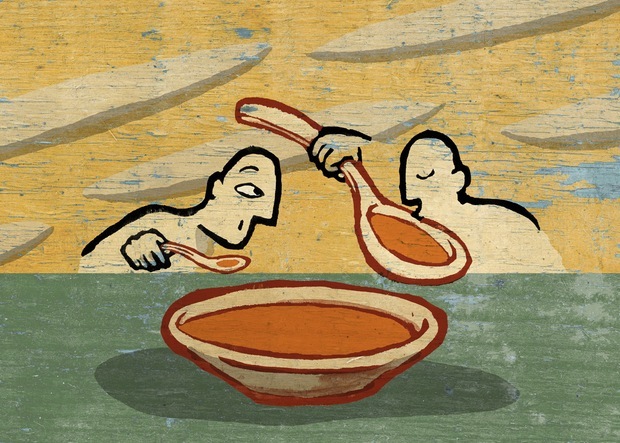 They see the globalization agenda as being set by large companies that successfully play one country against another. They read the revelations in the Panama Papers and conclude that globalization offers a fortunate few opportunities to avoid taxes and regulations that are not available to everyone else. And they see the kind of disintegration that accompanies global integration as local communities suffer when major employers lose out to foreign competitors. But those who exited our societies are now also exercising their voice to set the rules by which the rest of us live. The 1% are buying political influence as never before. Think of the billionaire Koch brothers, whose fortunes will shape this year’s US presidential elections. In Britain, remember the hedge fund and private equity barons, who in 2010 contributed half of all the Conservative party’s election funds – and so effectively bought the Tories their first taste of government in 18 years. 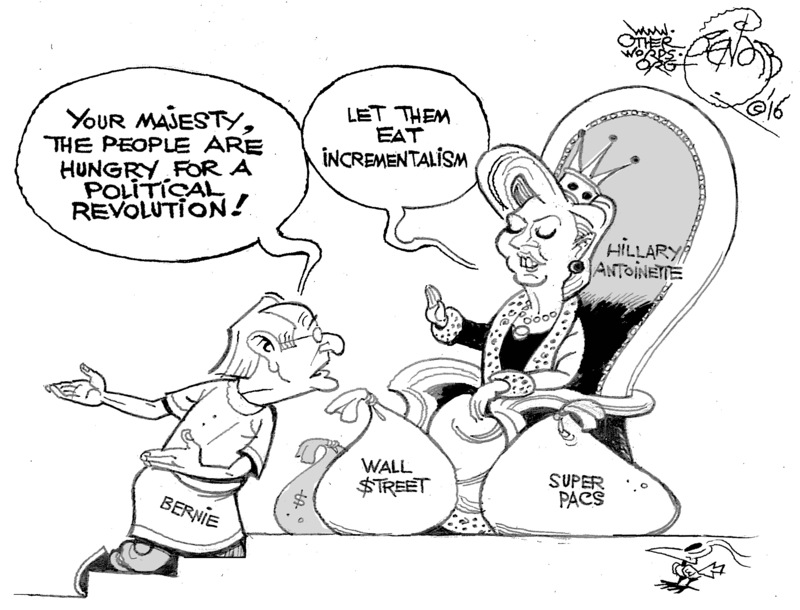 Capitalism, of course, has always been a racket of the ruling class. Now, it seems—with revelations about unequal health and life spans, the costs of globalization, the ability of a tiny group at the top to exercise both exit and voice, and much more—its legitimacy is being called into question. “Listen,” he said, “don’t get the idea I’m one of those goddam radicals. Don’t get the idea I’m knocking the American system. The American system…” As though an invisible chairman had called upon him for a few words, he broke into an oration upon the theme. He praised freedom, enterprise and the pioneers. He spoke of “our heritage”. He referred with contempuous [sic] disgust to Socialism and Anarchism. “My rackets,” he repeated several times, “are run on strictly American lines and they’re going to stay that way”…his vision of the American system began to excite him profoundly and now he was on his feet again, leaning across the desk like the chairman of a board meeting, his fingers plunged in the rose bowls. “This American system of ours,” he shouted, “call it Americanism, call it Capitalism, call it what you like, gives to each and every one of us a great opportunity if we only seize it with both hands and make the most of it.” He held out his hand towards me, the fingers dripping a little, and stared at me sternly for a few seconds before reseating himself. Compared with a scenario in which mortality rates for whites continued to fall steadily after 1998, roughly 650,000 people have died prematurely since 1999 — around 450,000 men and nearly 200,000 women. That number nearly equals the death toll of the American Civil War. The rule is, as countries get wealthier, their annual hours worked per capita tend to decrease. But the United States is the exception. Americans work longer hours than people in any other advanced country (and just a bit less than people in much poorer countries). American exceptionalism therefore means that people are forced to have the freedom to work longer hours in order to achieve a shorter life expectancy, less leisure time, and higher levels of inequality than in other advanced countries. Note: the chart above show, on the vertical axis, annual hours worked per capita and, on the horizontal axis, GDP per capita as a fraction of U.S. GDP.